Virtual reality, augmented reality and mixed reality tools are coming to the workplace sooner than you think. Is your IT department ready? Reality ain’t what it used to be. Augmented reality, virtual reality and mixed reality tools are creating a lot of buzz — as well as a lot of potential headaches for IT departments in everything from networking and security to data retrieval. Even understanding what each of the terms refers to can be confusing, as they aren’t always used consistently. The term “mixed reality” (MR) was coined by researchers Paul Milgram and Fumio Kishino in 1994 to refer to every sensory environment in between the purely physical and the purely virtual. But over time, it fell out of use in favor of the more specific “augmented reality” (AR) for digital information overlaid on the real, physical world and “virtual reality” (VR) for a completely digital environment. Over the past few years, Microsoft has revived the term “mixed reality” to market its HoloLens product, and vendors now tend to use the term to refer to the projection of 3D virtual objects or holograms into physical space. With AR, the digital overlay usually appears to float on a plane in front of the observer, while with MR it’s possible to walk around a virtual object to see it from all sides. “When you think both AR and VR, think of them as user interface technologies,” says Nguyen. “There’s a handful of horizontal applications for AR, like task itemization and pick/pack lists. I put on my [AR] glasses, and it says, ‘Hey Tuong, you’ve got to go down to Aisle 13, Bay 4 and pick this off the shelf’ and maybe overlay a little map.” And both AR and VR could prove useful for design and collaboration, he says, enabling building engineers and construction workers to visualize how structures are going to look in place. 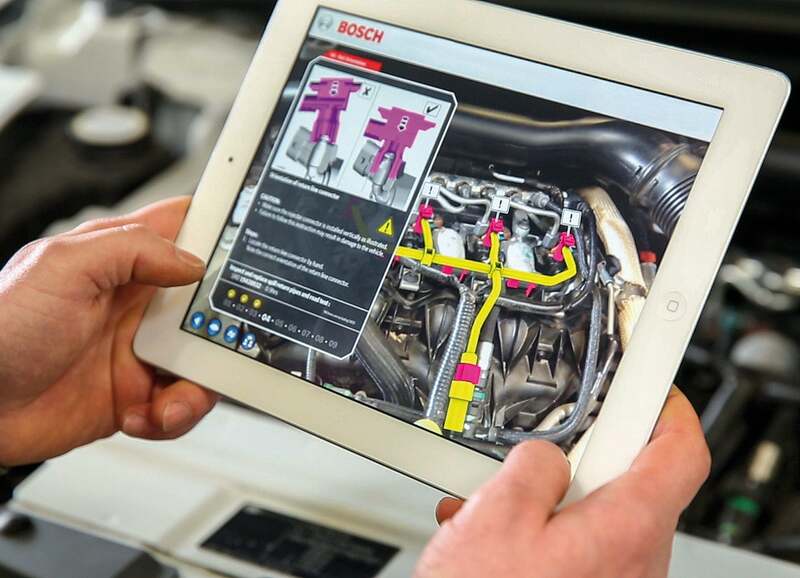 Automotive technicians can use Bosch’s AR system to view the part they need to work on highlighted against an image of the actual engine needing repair. Nguyen agrees. “We have a head-mounted display, it’s a portable device, it probably will have a camera on it, and the camera might be on all the time,” he says, recalling that when phones first started getting cameras, IT departments were going crazy. AR, VR and MR deployments may seem a long way off, but it won’t be long before most enterprises will need to be ready. While consumer AR apps like Pokémon Go may get all the buzz, Nguyen says, “What I’m seeing is that business-to-business AR is ahead of business-to-consumer AR, whereas on the VR side it’s flipped.” He estimates that enterprise use of AR technology is two or three years ahead of the consumer side. “I expect the maturing and the traction within the enterprise to continue to outpace the consumer side, at least in the next three or so years,” he adds. And with Apple’s June announcement of its ARKit developer framework for easily creating AR apps, it’s clear that the company envisions AR having a significant presence on millions of iPhone and iPad users after it releases iOS 11 this fall. Initially, most of those apps will be consumer-facing, but they’ll be entering the workplace on employees’ mobile devices whether IT is ready or not. And, of course, ARKit opens up even more opportunities for companies to create worker-facing AR apps. 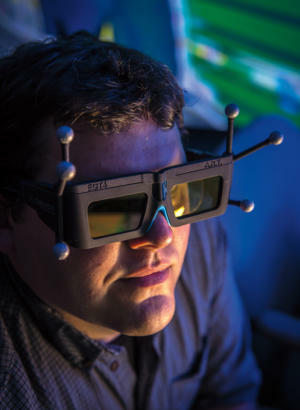 Corporations such as Boeing and Bosch are already running pilot programs with AR, VR and MR, as are educational institutions such as Case Western Reserve University. We spoke to these three organizations about the benefits and the challenges of mixing realities, and sought advice for IT departments preparing for the coming influx of apps and devices based on these technologies. Aviation giant Boeing has been experimenting with augmented reality for nearly 30 years. In the late 1980s, researchers were using headsets that could show a 2D display of a wiring diagram in a complex wiring harness. A more recent effort began about six years ago, starting in Boeing’s satellite factory in El Segundo, Calif.
Boeing Research & Technology systems engineer Adam Richardson works on design problems for the 777X aircraft using glasses that let him see a 3D virtual reality image of part of the airplane. For the company’s IT department, one of the biggest concerns is with putting the new devices on the network. “We have very stringent security requirements for what we allow on our network,” Davies says, “so when new devices come out from vendors — headsets or whatever — if it’s not running our enterprise load of Windows, it can’t go on the network. Even if it is, it’ll probably still have to go through a review.” To that end, the IT department is adding staff familiar with mobile device management and wearables. Sue Workman, CIO at Case Western Reserve University (CWRU), was not impressed with her initial experiences with virtual reality. “You put these glasses on, and the data comes to both of your eyes working separately rather than together. It was not very realistic, and it made you feel dizzy or even a little bit sick,” she recalls. When Microsoft invited executives from Cleveland Clinic and CWRU to a demo of its HoloLens “mixed reality” devices in 2014, she expected more of the same. Instead, she came away excited for what HoloLens could do for her school’s curriculum. “We’re building a health education campus with Cleveland Clinic,” she explains, a 485,000-square-foot building scheduled to open in 2019. “It will house our schools of medicine, nursing and dental medicine, including Cleveland Clinic’s Lerner College of Medicine.” The school didn’t want to include cadaver labs in the new building, so Workman had been looking for ways to teach anatomy without cadavers. 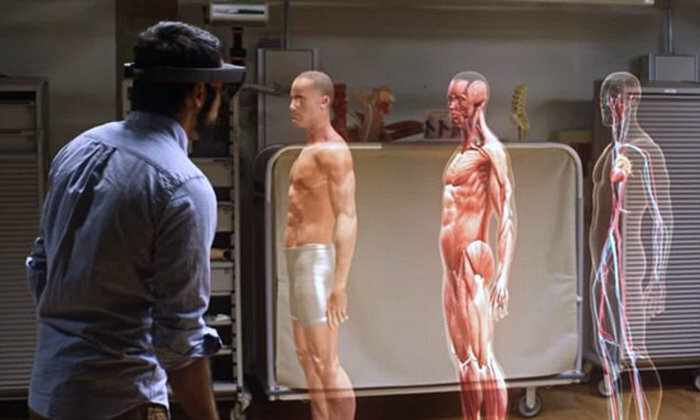 The HoloLens MR technology projects 3D anatomic holograms into the room, where students can see them from all angles and interact with them, as shown in the video at the top of this article. Case Western Reserve University’s medical school is exploring the possibility of using mixed reality to teach anatomy without the need for cadavers. Bosch Auto Parts, which produces everything from brakes to batteries, is both a user and a supplier of AR systems, according to Juergen Lumera, director of global technical information systems product management and Innovation at Bosch Automotive Service Solutions. Lumera works with both internal and external customers, helping their service and IT departments understand what they need to be aware of when implementing an AR product. “We do the majority of our applications — service information, training, and end-of-line production solutions — for automotive enterprises with twenty to thirty thousand users,” he says. 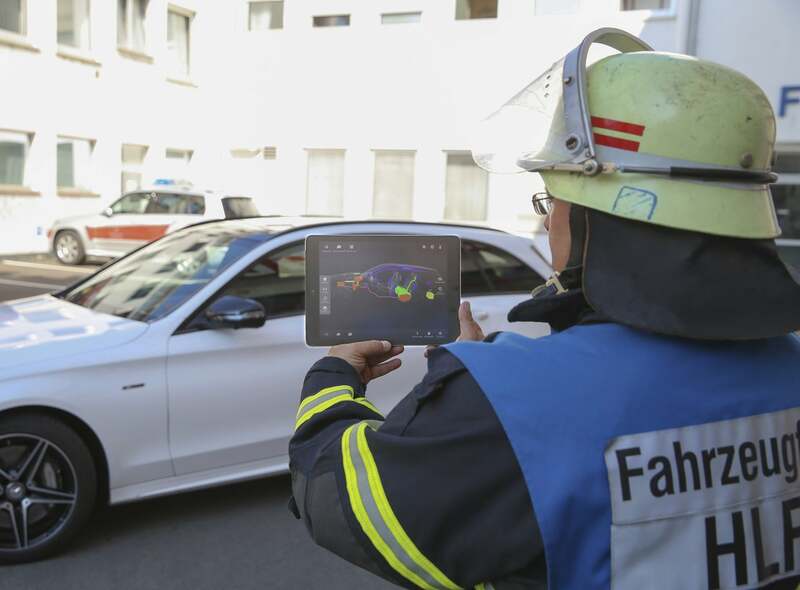 An example is the first-responder support developed for Daimler vehicles. When a vehicle is involved in an accident, rescue personnel may have to cut into the vehicle to extract passengers, and they need to know which parts of the car are dangerous to cut into. 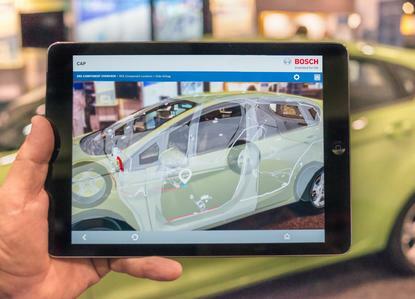 Bosch developed an app for smartphones and tablets that displays the relevant parts, superimposed on the device’s camera view of the vehicle, to highlight these locations. In cooperation with Daimler AG, Bosch has developed an app (based on its Common Augmented Reality Platform) that shows first responders where the dangerous parts of a vehicle are. The next problem is how to securely transport the data and ensure that each user gets only the data they need. “I really need to ensure that the 3D data has enough information to represent variants, and that I only see the variants relevant to me,” Lumera continues. He also points to security and privacy issues and the ways AR glasses differ from cell phones. An AR headset has a camera so it knows what data to display, but unlike with a phone, a user might accidentally look in any direction, not just at the product they’re working on. What steps should enterprise IT take now to be ready for these technologies? For developing such tools, he suggests thinking about recruiting staff from the gaming industry who understand the technology and the user experience. On the implementation side, take a cue from Boeing and look for workers who have mobile device management expertise. Get help from the experts. One helpful resource is the Augmented Reality for Enterprise Alliance (AREA), launched in 2015 to help organizations make decisions about these new technologies. (Bosch and Boeing are both members.) The organization has recently developed a set of global enterprise AR hardware and software requirements in conjunction with UI Labs, Lockheed Martin, Caterpillar and Procter & Gamble. Accenture is already building a practice around these technologies, says Fauscette, adding that other large systems integrators are probably doing the same or soon will. “The general questions of, ‘I need to build this, integrate it, and build the content behind it’ could easily be the kind of help you get from a systems integration partner,” he says. Begin a pilot project. AREA’s Sage says enterprises should set up an incubator-style project or a “skunkworks” to work on testing and getting ready. Conducting small test programs can help companies ensure that source data is accessible and properly structured; identify trouble spots in networking, storage and security infrastructure; work through systems integration issues; and develop best practices around data privacy and device management. Whether you line up partners, start talking to integrators, set up a skunkworks, recruit staff with the right expertise — or all of the above — it’s not too late to get started. Remember, it was only about three to five years ago that BYOD was regarded as a new trend. For IT departments, reality in any form comes at you fast.